Men are no different from women when it comes to hair loss. Yes, women are not the only ones to experience hair thinning due to extensive hair loss, but men are at an equal risk as well. In fact, it is estimated that more than 80 percent of men experience major hair thinning by the time they turn 50. The statistics are really worrying as men as early in their 20s start to experience hair thinning and male baldness. Male-pattern baldness is a genetic trait. That is, you are at an increased risk of hair loss and baldness if anyone in your family suffered it from too. 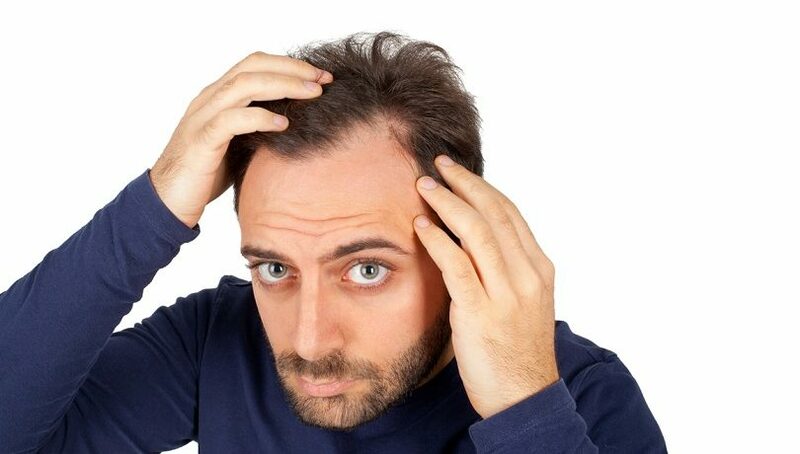 Protein deficiency, excess of vitamin A, stress and prolonged illness are some of the other reasons behind hair loss in men. It may be hard for males to live with the idea of losing all hair on their scalp one day, but the good thing is that they don’t have to. It is very much possible to reverse hair thinning, hair fall and male-pattern baldness due to different reasons, except the genetic factors. Hair loss is a natural phenomenon. Therefore, it can be best controlled with the help of natural remedies and changing your lifestyle. Some of the men’s hair loss solutions that can help stop hair from falling off are explained below. Keeping your hair and scalp clean is the first and the foremost step in preventing hair fall and hair thinning. Excess accumulation of oil and dirt on the scalp of people who do not wash their hair regularly end up weakening the roots and clogging the hair follicles, leading to excessive breakage and hair fall. However, make sure to use a mild shampoo every time you decide to wash your hair. Vitamins are absolutely essential for the health of the hair, especially vitamins A, B and E. While vitamin B prevents hair from premature greying, vitamin E helps maintain the health of the scalp by nourishing the hair follicles and keeping them active. Vitamin A, in the other hand, facilitates the production of sebum and helps keep hair roots healthy. But make sure not to take an excess of vitamin A, which may lead to hair fall. Men who suffer from hair loss should probably stop touching or combing their wet hair. Wet hair are considered to be the weakest and thus, there is an increased risk of hair breakage just after shampooing. You can gently clear out tangled hair with the help of your fingers, but do no use a brush or a comb. In case you must use a comb, make sure to use a wide-mouthed one. Dandruff is yet another reason that may lead to extensive hair loss in men over a period of time. In case you suffer from hair loss and have dandruff, vinegar can act like a miracle. Just rinse your hair with cap full of vinegar diluted in a bucket full of water. This helps clear the pores that may get clogged because of dandruff and thus, helps promote hair growth. Inadequate blood circulation in scalp is yet another major reason behind hair loss in men. Proper blood circulation makes sure that all the cells in the scalp get oxygen for its survival. In the absence of proper oxygen, these cells and follicles may not function properly or may die off. Thus, massaging your scalp with coconut oil or an oil of your choice helps keep circulation high. This is particularly important for region of baldness on the scalp.